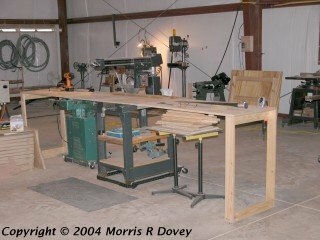 Here’s my radial arm saw (RAS) and a view of the table I built a few years ago. This 48-inch wide, 3/4-inch plywood table replaced a 40-inch wide, 3/4-inch MDF table that had provided almost thirty years of service. The old table had become scarred, worn, and badly warped by humidity. I chose ACX plywood to have a good top surface and better resistance to the effects of humidity - and the 48-inch width to better support long boards. This closer view shows the mounting screws and leveling set screws on the left side of the table. 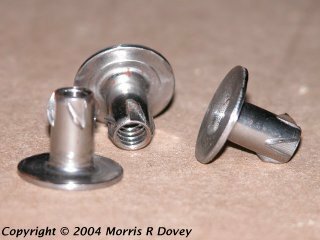 I replaced the rusty mounting bolts, washers, and nuts with stainless steel button head cap screws, washers, and anti-vibration nuts. 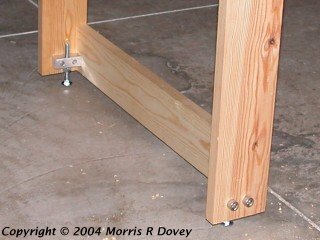 The cap screws secure the table to the steel saw frame. 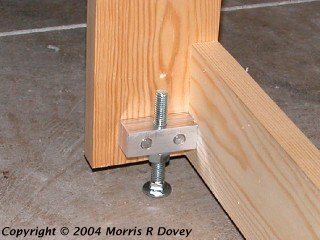 The Allen set screws are threaded into Propel nuts and are used to level the table. For anyone not familiar with Propel nuts, here’s a close-up of some I bought from Lee Valley Tools. 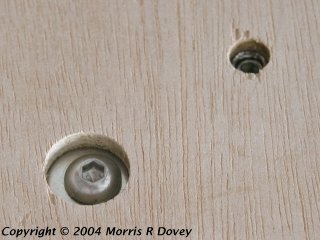 In this close up, you can see in detail how the table was counterbored for the mounting screws and washers; and you can see the very top of the Propel nut and the leveling Allen set screw in the smaller hole. The hole for the Propel nut is slightly (1/16") counterbored on the bottom. 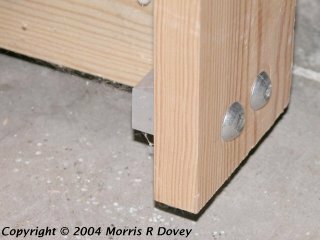 A hex ball driver makes it easy to adjust the set screws in leveling the table. 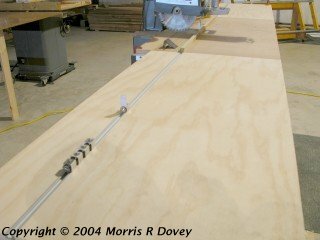 After adding wings to extend the table to twelve feet, I used some scrap wood under the lower leg stretcher to level the wings. After sweeping the shims out for the hundredth or so time with the shop vac power cord, I decided that I needed a better way to level the wings. I didn’t like the prices I found for off-the-shelf leg levelers. 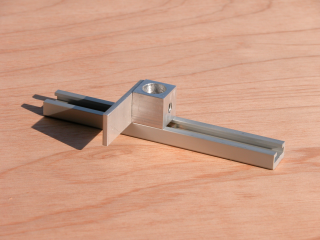 I keep some 3/4"x3/4" aluminum bar stock in the shop - just because it’s turned out to be exactly what’s needed for a lot of the jigs and fixtures I’ve built. I cut four 2" lengths and drilled three 5/16" holes in each piece. 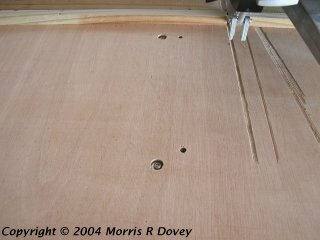 One hole is centered and the other two are drilled 1/2" from the center of the adjacent side. I tapped (threaded) all three holes 3/8"-16. I happened to have some 3/8"-16 x 1-1/2" socket head cap screws on hand and I picked up some 3/8"-16 x 3-1/2" carriage bolts and nuts at the lumber yard. I assembled my "leveler" as above and snapped a photo so you can see how simple the whole thing is. 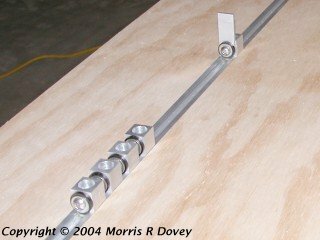 The next step was to drill a pair of 3/8" holes 1" apart and 1" from the end of each leg and bolt the leveler assemblies snugly in place, then adjust each carriage bolt to level the wings and snug up the jam nut so the carriage bolt would stay where I'd adjusted it. Here’s a closer view of the installed leveler. 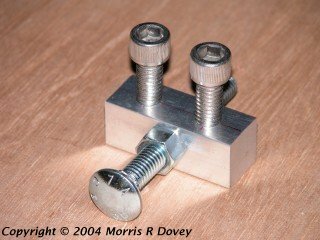 I plan to replace the socket head cap screws with stainless button head cap screws because they’re lower profile - and I plan to replace the carriage bolts with stainless steel (which my lumber yard doesn’t carry) to avoid rusting. When I was all done, I checked my receipts and calculated that my levelers had cost about US$1.75 each for materials. I’m well-pleased with the result. I did (finally) get around to replacing the socket head cap screws with stainless steel button head cap screws, and I like the reduced profile much better. Here’s a close-up view so you can judge for yourself. 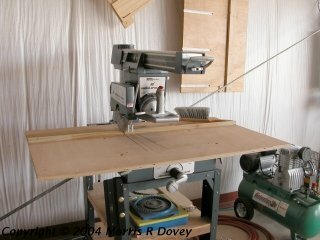 Since I do a fair amount of repetitive cutting on the radial arm saw, I wanted to be able to set up multiple stops. I routed a 3/8" deep, 3/4" wide dado and installed t-tracks in line with the fence (in the outermost position) on both wings. I cut some 3/4" aluminum cubes that I drilled twice and tapped once, then screwed on "flippers" to serve as stops. The flipper is secured with a nylon washer, a stainless steel washer, and a stainless steel 1/4-20 button head cap screw. Here’s a close up of one completed and four not yet complete (flipperless) stops mounted on the track. A photo of a stop with the flipper in the down position.